October 2, 2013 August 1, 2012 by C.S. Clarke, Ph.D. 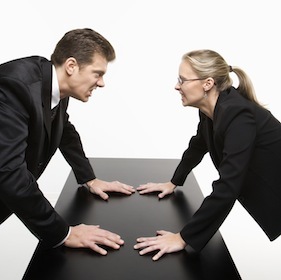 This technique is for people directly involved in a conflict, not their managers, employees or business partners. It only works for those who actually have the power to end the conflict. 1. Conflict isn’t about the facts, it’s about the feelings. If you are in conflict, you feel that you have been cheated, betrayed, victimized, helpless (disempowered), unfairly blamed, abandoned, unjustly penalized, ignored, marginalized, discriminated against or whatever. And you feel angry. Perhaps you feel hurt. 2. Most conflict is petty. It just doesn’t feel petty to the people involved. That is to say, the actual facts or cause of the feelings behind the conflict are petty. Most of the time, the causes of conflict are repeated annoyances by people who can’t get away from one another. Conflicts usually involve things like offices mates who constantly talk too much or too loudly on the phone while you try to work. Or people who drop into your office or cubicle to whine and complain and waste your time. Or people who manipulate things so you end up doing their work. Or people who gossip about you. People who tell lies about you. Bosses who don’t back you or support you. Bosses who don’t listen when you report issues that affect your work. Bosses who ignore your expert advice, which you were hired to give them. Or senseless office rules that interfere with your work or your ability to perform your best. Sure, there are plenty of things that happen that are serious. And you need to deal with those, too. But most the most common conflict you find at work is in the nature of what psychologists call simple “ego injuries.” You feel hurt and angry because something bothersome is going on that you can’t control and it makes you feel powerless and unimportant. 3. The person who controls his emotions wins the conflict. Because ending the conflict is winning. If you take charge of your emotions you take the power in the conflict. Regardless of rank, status or relative strength. The conflict is about your trying to change someone else or his/her behavior. By some sort of force. That person is resisting. He thinks he’s right. He knows he’s right. He feels he’s right. It’s like trying to change someone’s religion or politics. Can’t be done. But think about it for a moment. You, too, think you are right and that the other person is wrong. He can’t change you either. The real conflict in a conflict is each side trying to force the other to do something he doesn’t want to do. It doesn’t have to do with who’s right or wrong. It doesn’t even have to do with who is stronger. It has to do with how you get and use power. And the only real power to change is the power you use to control your own feelings and behavior. You can change how you look at what is happening and change what you do. You can stop struggling to get the other person to change. You can start doing things that make the other party have to change in response to your behavior. Or you can do something that makes his behavior irrelevant. For example, if the person is constantly annoying you with noise, you can simply ignore him and wear headphones with noise cancellation or earplugs. Sure, he’s an inconsiderate pig. So what? Your real solution is to stop the noise, not reform the pig. You can go directly for the end result you want through your own power rather than through trying to force a solution on someone over whom you have no power. 2. Explore and plan for resolution of the underlying dispute — even if only you, all by yourself, work out the plan and create the outcome. Once you have accepted that the only thing you really have control over is yourself, you can get clear on how to solve your problem without involving the other party in the solution. If you choose to disengage from conflict, the conflict is over. Almost instantly. Seemingly magically. And it reveals to you that, all along, you had the power you had to get what you really needed. The following two YouTube videos have different perspectives and different issues involved in workplace conflict. This video by Daniel O’Connor of Power Diversity takes on the issue of how to respond to negativity in workplace communication. It’s both entertaining and helpful. Do you have computer-related eyestrain?